A Conversion can sneak up on you too. As a young boy I loved science fiction, but as I got older I lost my fascination for fantasies. I took learning about the "real" world seriously. I had an interest in sports, history, self improvement, psychology, philosophy, biographies of successful people. I enjoyed fiction, but avoided anything that seemed too unrealstic.. I have known Barry Finn, mostly as my employer at The Rider and Orange aPEEL for over fifteen years. He always struck me as an intelligent and very reasonable person, but had one fault. He was obsessed with science fiction and fantasy. Everyone is entitled to a fault. However as I developed interests in different directions I knew where I could turn if there was a science fiction angle and from time to time it would enter our conversations. I came to think of it as science speculation and a whimsical extension of philosophy. Through Barry I stumbled on Robert J Sawyer, a Canadian science fiction writer. One of the first books I read was "Calculating God" which interested me having heard about it on the radio and taking an interest in the philosophical perspective. It had Canadian locations that I was familiar with and so my identification was reinforced. Later following radio references to Neanderthals I picked up on a Robert J Sawyer trilogy, the Neandertahl Parallax. This time I found the narrative very compelling and again an identification of some of the scenes. The author gave me a different perspective on humanity. We humans are very vain and can't help thinking we are the centre of the universe, and of all meaning. Sawyer pictured an alternative universe with many features that seemed very logical. It seems obvious Sawyer is using science fiction as a vehicle to make philosophical points and different models for living. As someone once said a fish is not conscious it is living in water, just as we are not conscious that we live in the air and have a worldview that seems natural to us. More recently I took up an interest in Robert Sawyer's www trilogy. The first two books were the first two books I read on Kobo and the third I decided I couldn't wait for the electronic version. In this series I was more conscious of Sawyer's use of a science fiction platform to make political, social and more importantly philosophical views. Because I tended to agree with his philosophy I ate them up, but they opened up more thinking. One of his contentions was that science fiction is still literature and good science fiction should be taken as seriously as any good literature and it has relevance to our "real" life. He makes some reference to Margaret Atwood (someone I have read sporadically, but admire). Margaret was on a recent radio program, On Point where she suggested the category of science fiction could be expanded and include her. I look forward to reading her latest, "In Other Worlds: SF and the human imagination." The bottom line of any book is the story. Does it entertain you? Does it stretch your thinking? For me I admit if it seems so far fetched it has nothing I can link to in my own life I lose interest. It is not that I have to believe the science is imminent, but the human reactions have to be believable. Robert Sawyer has done a great deal of research, meaning his speculation has a solid base. I recognize science is critical for our future, yet I have only a superficial understanding. Science fiction can help a reader to better understand science, but of course you have to be able to separate what is workable today and what might be workable in the future. The fiction part is what allows the author a vehicle to offer alternative models and sometimes to make profound observations. The www triology is a compelling story to possible scientific progress. Geo political possibilities (cf to earlier reviews of The Great Disruption and 2030). The main heroinne is a girl relocated to Waterloo Ontario. She starts the story as a blind person who is offered a chance to get sight by a doctor in Japan. He accomplishes this with some unexpected side effects. The young girl has an autistic father who is very gifted scientifically and a mother who is a liberal with a feminist perspective. Along the way you encounter a variety of people in power and in the margins, that are eventually linked up as in reality we all are. I don't want to give away any of the stories, but feel confident if you are reasonably intelligent and reasonably open minded you will find Robert Sawyer hard to put down. Barry never tried to persuade me to re-visit science fiction, just made me aware that it was one of his passions. When I expressed an interest he offered to lend me a book. I guess you could call it quiet persuasion and and I have bought into it. When you are open to different possibilities your life becomes richer. A salesperson might be considered the last link to the customer. By the time a product or service reaches the sales person, marketing is just about done. Or is it? This post is meant to concentrate on how a sales person can apply marketing strategy to actually selling. The sales person is the critical link with the person who actually buys or the person who is considering buying (or theoretically should be considering buying.). A lot of information can be gained in these contacts, some that can be captured easily with numbers and some that are more difficult. The marketing department should certainly be interested in this knowledge, but it is most critical to the sales person. Marketing begins by asking questions and searching for answers. The focus is on looking for solutions to problems that benefit both sides to a sale. The buyer has to be see value in the solution, but the selling company has to make a profit. A salesperson has been given a solution so perhaps the first question should be how well do you as a salesperson understand the solution? Do not be afraid to ask questions. The people higher up in the chain have been working on this solution for awhile and to some degree assume it is obvious, but that is not always the way it is initially perceived by prospects. Do you understand the problem the solution is supposed to somehow mitigate? One step is to use the product your self. You are apt to encounter some confusion, some awkwardness the first time you do anything. You will probably learn some limitations which will allow you to avoid over promising. Your prospects will likely go through this process, although not all exactly the same. You can't wait until you have mastered every aspect of the solution. Every prospect becomes an opportunity to learn more. They will encounter problems you might not have anticipated. They may also find better ways of applying your product than you had been aware of. Discovering new applications should not always be a surprise. You have been given an idea of what the problem is that your product solves, but who has this problem? Who might recognize this problem? How serious is it to them? How does it fit into their overall priorities? How can you demonstrate or present your solution effectively. The process of understanding the problem is similar to that of understanding the solution. The purpose of this research is to refine your targeting and your presentation. Some people will find your solution more understandable than others. Some will have a greater need for your solution. Some will have the authority to take advantage of your solution. You will come to understand what the obstacles to acceptance of your solution are and better ways of dealing with them. There is a difference between marketing and actually selling, but an understanding of both will benefit each. A salesperson has to manage their time to balance the opportunity including preparing, doing (actually communicating with prospects) and understanding. They need to understand human nature to overcome fear and indecisiveness. They have to have some understanding of the political environment for the decision process. They have to persist in the face of rejection, but also develop the judgment of where persistence makes sense and when to shift efforts. Above all all salespeople must earn trust so their solutions will be accepted. Developing a data base (another blog post) will help you in future targeting and prioritizing. ARE SELLING AND MARKETING THE SAME THING? Selling and marketing are terms that are too often inter-changed. People who are really selling will frequently say they are in marketing. Outsiders often assume if someone says they are in marketing, they are really in sales. Selling doesn't sound as prestigious as marketing, but at the same time people in marketing sometime feel they are really just selling. There are people at the margins for both occupations performing both functions. The big question is "Are marketing and selling separate disciplines? or "How are Selling and Marketing related?" Hub Foley, a publisher I worked under at Metroland explained it best. Selling is necessary when someone (a manufacturer, wholesaler, retailer, individual) is "stuck" with some goods and need to find someone to buy the goods so a livable profit can be extracted. They most likely made a conscious decision to get or make these goods, but now they have the problem of how to get rid of them. They may hire slick talking, rejection immune individuals to "sell." Good selling goes beyond slick talking and persistence and to be good requires skills that are natural to some and can be learned by others but are difficult for many people to master. Hub explained marketing starts before any "thing" is made. It is more basic involving decisions of what to sell and to whom and how and for how much. If we go back to the conscious decisions that ended with the manufacturers, wholesalers, retailers or individuals obtaining some goods we get a little closer to marketing. Ideally marketing really goes back to original decisions. What can be made (actual goods) or implemented (service that either is the good or supporting goods) that someone would be willing to pay for in enough quantity that we can have a profit left over after all the costs. This can require a lot of research and a lot of heavy thinking. That is the essence of marketing and may require a lot of money, effort, expertise and skill. It boils down to decisions on which path to pursue. You could continue doing what you have been doing, making stuff or offering services. In modern times that decision could mean declining sales as consumers identify stuff and services offered by competitors that more closely match their needs and wants and is perceived to be more affordable . Eventually many products and services become obsolete or more commonly at an earlier stage become unprofitable. Thinking ahead marketing asks the most basic questions. What can you make or do that consumers would be willing to pay enough to make a profit? Research and brain storming can identify opportunities. The actual cost of producing a good or a service has to be determined, but also an estimate of how quantity will affect final costs. After the product is available there will be other costs that need to be allowed for as you will soon appreciate. On the long road to making a profit are other concerns. What price should you offer it for. You need to make a profit, but if you overprice your product or service not enough people will buy. On the other hand if you underprice (but still make a profit) some people will assume it is not worth their time and you are of course not optimizing your profit. Underpricing can be useful if it is a loss leader or boosts cash flow or you are unloading goods that are taking up valuable space and time. Pricing is complicated by another marketing concern. What channels of distribution make the most sense. You could knock on every door or mail to every mail box, but that is expensive and for most products and services most of your effort will be wasted. You could knock on fewer doors by concentrating your effort on retailers who already have customers looking for something like what you are selling/marketing. Of course you have to share your profits with the retailers, but balancing that is less waste. Many manufacturers distribute through wholesalers who have connections with retailers. The offset here is that again you have to share your profits with the wholesaler and you are still sharing some of your profits with the retailer. You are cutting waste even further (promotional, transportation and even clerical). Increasingly goods are also distributed on-line. This can be very efficient, but can be in conflict with other efforts and requires its own set of skills and expenses. This leads to still another complication. Your product just sitting on a store shelf or worse a warehouse shelf might just gather dust, if suitable prospects are unaware and unmotivated to buy. How best to present your product to those people your research indicated would be most interested? How can you reach these people? Do they watch television and do they have any preferences? Do they listen to radio and when and what do they listen to? What newspapers or magazines do they read? Are they tuning out these traditional channels and where might they be more likely to pick up your messages. A lot more research. How best to present your product or service so that your targeted audience will be more likely to buy? If marketing is totally successful all that is needed at the actual buying end are order takers. These are people who take the customer's cash or credit card in exchange for your product. Services can be almost as automatic where customers for example wanting lawn-care don't even have to make the call and don't even have to write a cheque as the payment is an automatic bank withdrawal. Most products are complicated and have competition so some sort of selling effort is required. If the complications and competition are relatively low the sales cost can be relatively low, but if with the complications or competition is at a higher level you might have to pay a higher percentage of the sale price. I have adopted a price focus in explaining marketing, but actually it relates directly to all the other decisions. How you decide to distribute your product, how you decide to promote it can help determine the price as much as the price dictates how you distribute the product and how you promote it. The photo of the two whales is by my brother Marshall Davidson and symbolizes that, yes marketing and selling are different disciplines, but they are related. I intended to write about how sales people and those lower in the chain can integrate marketing strategies to help them sell better, but this already too long. See you next time. Blogging was supposed to be spouting off my theories and odd tastes on a world stage. The truth is no matter how rich and powerful we are (which I am not) we all live in a very particular location where we are rooted. I feel fortunate to live in Hamilton, Ontario. I didn't grow up here and I certainly didn't crave to live here. As a youngster I grew up in Oshawa and one of my interests was the CFL, but I never rooted for the Ti-Cats. Later I moved to a touristy cottage area, Haliburton for my last two years of high school. As a hitch-hiker I was given a ride by a Hamiltonian who was very glad to visit "God's country" as he described my home turf and denigrated Hamilton. Looking back I think he was merely describing the inside of a steel plant. but certainly did not make Hamilton appealing. My dad was a truck driver who liked to drag his kids on some of his trips. One I remembered was to Hamilton. As we approached Hamilton we went over the Skyway Bridge which was scary for me as I hate heights and sitting inside a truck just exaggerates the feeling. We went along Burlington street (for those not familiar with the area it feeds into an industrial area) and went to a business only a short distance from the exit and dumped his load and then turned around. That was my introduction to Hamilton and I had no desire to repeat a visit. After school I needed to find a job. For me it was arduous, but back in those days I typed up hundreds of letters seeking employment all over Ontario. Hamilton was always last on my list and I felt fortunate some other prospects responded first. I eventually was offered a job by a Toronto company, but they had a more urgent need in Hamilton and since I had no real connections in Toronto suggested it was a better opportunity. With a married sister living in nearby Burlington I accepted. Eventually I was fortunate to to meet a local girl, did go through a series of job changes and house moves and settled in Hamilton. At one point I did commute to Toronto and I remember some people expressing pity when I explained I lived in Hamilton. As time went on I had two children and through them developed many ties to the community because of their interests in sports and music. They both did something strange in choosing university. One chose Halifax and later the other chose Victoria (a story for another blog). My wife and I spent a lot of vacations on one coast or the other and got to see a big and enjoyable hunk of Canada from our Hamilton base. 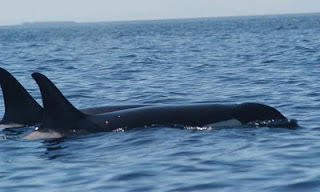 Heather returned to Hamilton after her stay in Halifax. Lately she found herself getting more involved with Hamilton in a bigger and bigger way. Technologically way ahead of her parents she put a lot of energy and creativity into boosting Hamilton. She founded #TeamHamont with the help of many friends. This past weekend her efforts tied into a big event Supercrawl. I am sure there will be greater things to come and more people will be aware there is more to Hamilton than they used to think. Just before the weekend I attended my first tweet-up organized by Heather. I knew something of the people through Twitter, but it really was a pleasant surprise to put faces (and voices) to names. I really have only had a few conversations, but it illustrates social media in a way I had not thought of before. My twitter contacts are real and unique, but also we are all tied together in a few ways. What do I like about Hamilton? Cootes Paradise and Bayfront Park (within walking distance). I have come to appreciate this is a city of Waterfalls (over 100). Our mountain, may not be a real mountain, but it is my mountain. I love the library and being in a town with McMaster University and Mohawk College. I love they have several theatre groups. I love the education system that helped shape my kids (and me as well). I love the Downtown Farmer's Market. The Art Crawl is a wonderful way to spend a Friday evening. Most of all Hamilton is people who come from all over with a wide experience and a variety of outlooks. There is much more to Hamilton. If you haven't seen it why don't you find an excuse to visit. If you live here I am sure you have your own story to tell which I hope you will tell. One photo is a view Hamilton Harbour and the other is of a gathering of #TeamHamOnt during the recent Supercrawl. After reading "2030" I have been verbally recommending it to friends and associates more than most books I have read, even the most enjoyable ones. The underlying topic, the war between the generations is very apt to heat up and requires a lot of thought. As a member of the baby boomers, but also the father of two children (no longer actually children) I can understand some of the forces at play and they are a bit scary. 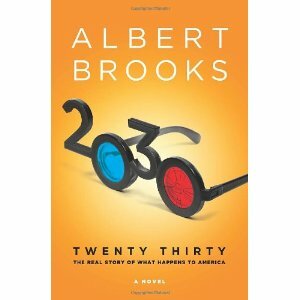 The author Albert Brooks, fortunately is a comedian and is able to make you laugh at various stages as he points out a very possible future scenario. It is much like satirists pointing out the injustice of bigotry so that as you laugh you see the truth a little more clearly. So although much of it is frightening a few laughs will lessen the sting. There are trends the author stretches to possible conclusions that we need to understand better now. One of the causes of confict is something we all hope will happen--a cure for cancer. Albert Brooks points out that that would exacerbate the generational conflict. As it is, us baby boomers have had things our way for so long we assume it is the right way and will continue through to our deaths in the very distant unforseeable future. As a few pundits point out we are progressing to a time when fewer people will be working and more people will be living in normal retirement years and beyond. As lives are prolonged and more people expect to enjoy retirement more stress will be created. It is easy to predict some general trends. Human nature resists change even as everything around them is changing. A feature of modern day government is that powerful entrenched interests have influence beyond their numbers. An example in 2030 is that one of the most powerful entrenched interests is the AARP (short for American Association of Retired People). One thing that is accepted as general wisdom is that older people vote more than younger people and they will vote for their own narrow interests. "2030" suggests their influence will actually increase and that it will intensify conflict with younger generations. We follow a number of characters that you wonder how they will be connected. The different characters illustrate the whole American society. You meet powerful people and those who suffer the consequences of historical decisions. Some of the people are thoughtful and good and others are either victims or exploiters. Some are frustrated and determined to change things to what they think is more fair. Medicare comes under fire. The author projects increasing cost pressures and that many people will not be able to afford it. At the same time others will live much longer and healthier. There will be the young who have to one way or another pay for the extra expenses of "retired" elders. One theme touched on by the author is machines to prolong life in an almost vegetative state. Chinese creditors are likely to become even more critical in our future. Like many of us you may have wondered why they would keep on giving Western institutions low interest loans. In fact it is one way of fueling their manufacturing. The author conjectures how we might move to a different financial arrangement which does seem plausible. A lot of "2030" is frightening and I am sure the author hopes we will take a hint and change our current ways. Some of it is encouraging and we can hope those parts actually happen. Some of us boomers are trying to understand and be fair. All of it is thought provoking and I think needs to be talked about more. The titles of these two books clash, but the authors are mutually appreciative. In "Mindless Eating" we gain some understanding of the multi tentacled conspiracy to persuade us to eat more than we need. In "Mindful Eating" we are encouraged to enjoy food more and to eat only what we need. 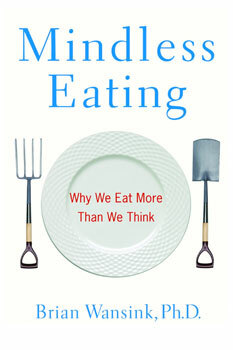 In "Mindless Eating" we learn about how corporate researchers have turned our innate human nature against our best interests. The author points out many of the corporate tricks and suggests how we can combat them. Larger containers and bigger plates encourage us to eat more with little awareness that we have done so. Advertisers of course, know how to appeal to our desire to eat tasty things and manufacturers are putting taste patterns together that are very difficult to leave alone. Many experiments are described showing that in fact people often do not realize how much they have eaten. or even really tasted their food. The author, Brian Wansink points out that taking smaller portions and slowing down can make a lot of mindless difference when trying to lose weight. The mindless part refers to the idea that you will tend to eat whatever is served on your plate without thinking. So if your plate is loaded you will eat it and think it normal, but that you can easily get used to smaller portions. If you find some way to eat slower such as using your non dominating hand, eating with chopsticks (assuming you are not used to them), putting down fork between bites or make a conscious effort to develop the habit of eating slower (eventually mindlessly) you will enjoy your meal more and not pack on unneeded calories. Brian Wansick does not think you need to do away with your comfort foods, but just take smaller portions and again eat slower. If you do something drastic like reducing your food intake by 500 to 1000 calories per day your body's metabolism will adjust and you will sooner or later tire of the effort. On the other hand if you reduce your calorie intake by 100-200 calories per day you will gradually lose weight painlessly (really mindlessly). "Mindful Eating" is in some ways more encompassing. The author, Jan Chozen Bays, MD admits her own weaknesses. She tells us that while writing this book she was eating a lemon tart and at first enjoying the taste, but then she starts to thinking about writing this book, and gets up to sharpen her pencil and realizes the taste has diminished. Then re-focusing she enjoys the taste again. She tells us not to feel guilty about what we crave, and in fact savour it, but with mindfully eating our body can tell us when we have had enough. She refers to many of the experiments in "Mindless Eating" to make her points. One of her underlying themes is that your body actually knows what it needs and how much. We have lost our ability to listen to our needs. She describes seven forces that encourage us to eat; the eye, the nose, the mouth, the stomach, the cellular system, the mind, and the heart. These are all triggers to make us want to eat and at one level necessary for our survival. At another level distortion can easily take over when we become obsessed with specific foods or eat almost anything without much thought. 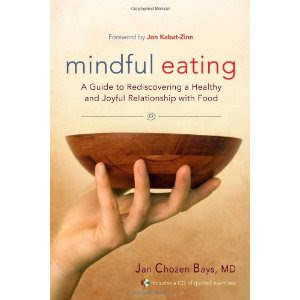 Accompanying "Mindful Eating" is a 70 minute CD. The author has a calming and clear voice delivering a number of separate topical tracks that help explain her message. Both books are useful for people wanting to lose weight. "Mindless Eating" identifies several ways corporate interests encourage you to overeat with some counter strategies. "Mindful Eating" points out by slowing down and really enjoying your food you will feel less need to over eat. Your body actually tells you what it needs, but we have learned to ignore that voice. On another level "Mindful Eating" points out the importance of focused thinking. Mindful eating could be just the starting point to get more out of life. Enjoy the moment. I started this post many weeks ago, but decided to post it just after Thanksgiving. Some of us have a lot to be grateful for. Thanksgiving is that time when we over eat. There are so many temptations and a load of tradition. Now we can slow down and be truly grateful for the opportunities we have been given and better appreciate them.